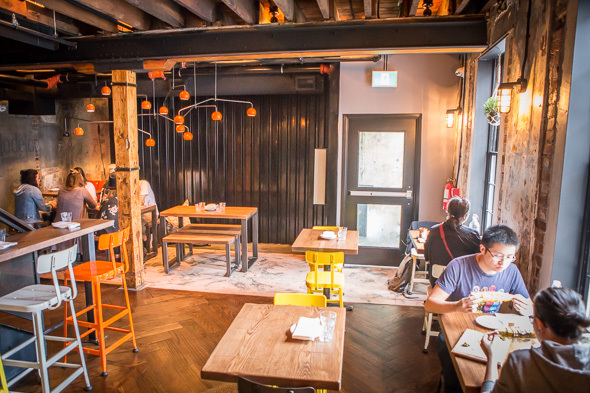 La Carnita has dubbed its third location LC Central to distinguish itself from its predecessors on College St. and Queen East . It's the latest expansion from Andrew Richmond and Amin Todai, who started the taqueria as a pop-up before spawning multiple locations and sister spots including The Home of The Brave and Sweet Jesus . 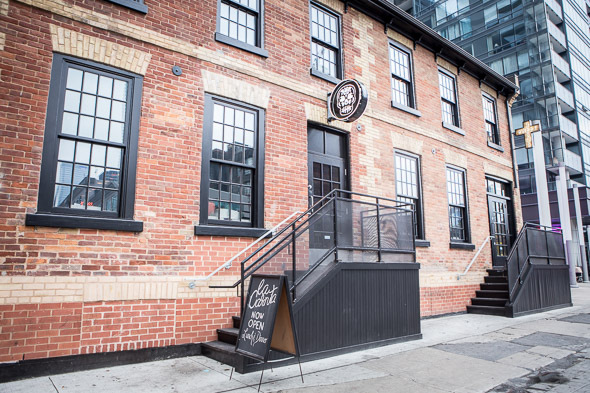 Occupying a restored heritage building on John Street just north of the TIFF Bell Lightbox, the two storey restaurant is positioned perfectly to attract the filmgoers, tourists, and the booming number of condo residents that have exploded in the vicinity. Thankfully inside doesn't feel like a tourist trap - the restaurant doesn't compromise on its gritty, urban aesthetic; the music is turned up to full-on fiesta; and the menu preserves signature La Carnita dishes like the Mexican Street Corn ($8.50), In Cod We Trust Tacos ($4.95), and Chorizo Meatballs ($9) plus a few new dishes and drinks exclusive to this location. 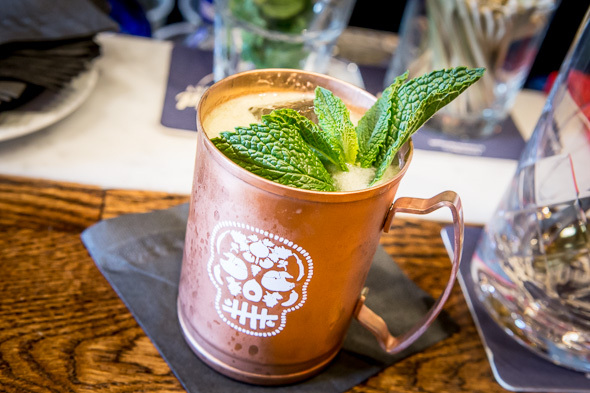 The bar menu boasts draught margaritas by the pitcher ($60) or glass ($12) along with a selection of craft cocktails like the #Partymom ($12), a blend of rum, Cointreau and Auga fresca, a house-made of cucumber, mint, chilis, lime juice and honey. There's beers too for $7.50 per pint, plus three different Cheladas ($9), hybrid beer-cocktails each highlighting sweet, sour, or spicy flavours. The scallop ceviche ($12) is among the new dishes to join the menu of staples. 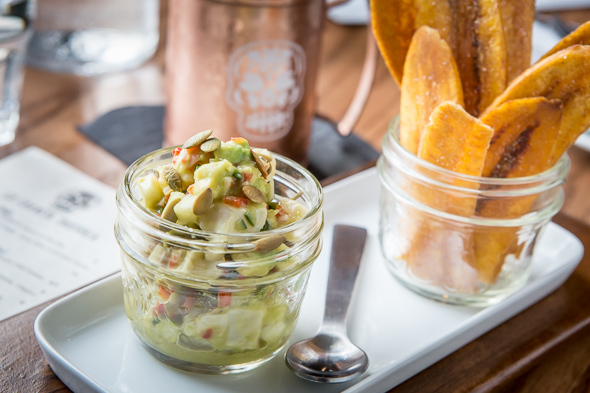 Presented with crunchy plantain chips, the dish is a medley of textures and tastes featuring sweet plump hokkaido scallops paired with creamy avocado, crisp green apple and nutty pepitas. Scorpion Wings ($14) are another welcome addition that adds some variety to the taco-centric selections. 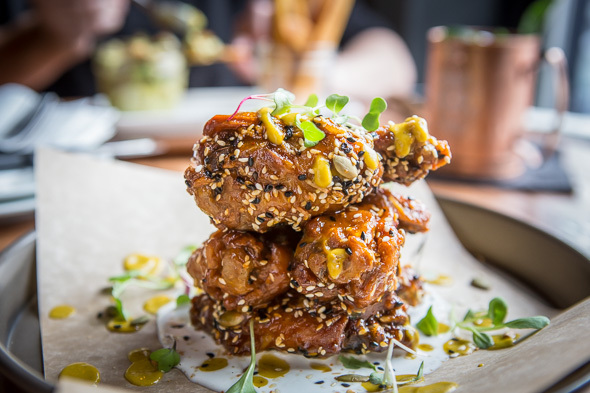 These are confit chicken wings deep fried and tossed in a fiery, crimson hue chili sauce sauce. They are not nearly as spicy as they could be, but the confit cooking has seemingly melted any extra fattiness away so that all that's left is tender meat inside a crispy crackling exterior. 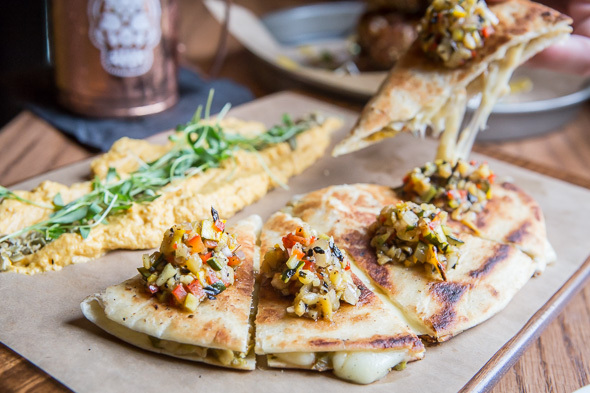 On the flip side of the one page menu, an enticing list of daily features introduces dishes like the veg-friendly Monday special; squash blossom quesadilla ($8) featuring a trio of Mexican cheeses (oaxaca, cotija, and anejo) pressed between tortillas. A finely diced grilled zucchini salsa decorates each wedge and a swoosh of butternut squash crema serves a delicious dipping sauce. There's no dessert. If you're craving something sweet, exit through the back and find yourself in the adjacent Sweet Jesus ice cream parlour where you'll be well looked after.